When looking for hardwood floor maintenance tips in Birmingham, AL, you’ve come to the right place. The maintenance of your hardwood floors or any floor surface requires a little bit of effort if you want to maintain the condition of newly installed material. When properly cared for, certain species of hardwood floors can last for generations. Even the softest of wood floor coverings can maintain their beauty for years, if you take the time to clean and maintain them regularly. A little bit of prevention can spare you a lot of trouble later on down the line. 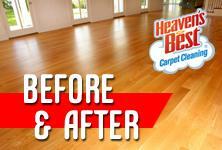 Hardwood, on its own, is very susceptible to damage from stains and moisture penetration. That is because it is a relatively absorbent material, and when dirt or liquids fall on its unprotected surface, they can seep down into the wood causing permanent damage from within, and below. Most hardwoods have a protective finish, but it’s important to know what type of finish your floors have for good maintenance. The biggest threats to the surface seal protecting your floor are some of the tiniest particles in your house. When small grains of dirt, sand, and grit are tracked into a room, every foot step will drag them across the floor, scratching at the finish on the wood, wearing it down. That is why regular vacuuming and or sweeping is necessary on a weekly or bi-weekly basis. For heavier traffic homes, you will want to sweet or vacuum daily. Even with wonderful maintenance and cleaning routines, you are going to need a good professional cleaning anywhere from 1-2 times a year on your floor surfaces. If your floors are ready for that extra attention, call Heaven’s Best Carpet Cleaning for an unbeatable cleaning and price. Our trained technicians can not only give you some great hardwood floor maintenance tips in Birmingham, AL but can get your floors back in the condition you desire! Give us a call today at 205-618-9150.